Liu He Ba Fa (Six Harmonies and Eight Methods) is a special internal martial art systempassed down by Master Wu Yi-Hui. Master Wu Yi-Hui is a very important figure in Chinese modern martial art history. He had superb skills, taught many students, and dedicated his life to Chinese martial arts education.Thousands of students learned directly from him. Many of his top students such as Zhao Dao-Xin, Zhang Chang-Xin, Han Jiao, Zhang Wen-Guang, He Fu-Sheng, and Jiang Hao-Quan later became famous martial artists in China and in the rest of the world. In 1936, the head of the Chinese Central Martial Arts Institute, Mr. Zhang Zhi-Jiang, invited Master Wu to become the Dean of Studies in the Chinese Central Martial Arts Institute. 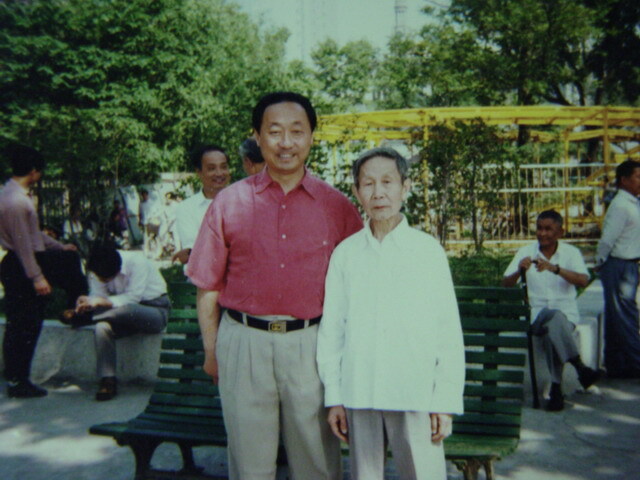 In 1948, Mr. Zhang Zhi-Jiang again invited Mr. Wu to be an associate professor and the head of the Martial Arts Department at the Chinese Physical Education Teacher's Institute. These invitations were extended because of Master Wu's deep understanding and mastery of the Chinese martial arts. The complete name of Liu He Ba Fa is Xin Yi Liu He Ba Fa San Pan Shi Er Shi, that is, Mind Intention Six Harmonies Eight Methods Three Stances Twelve Postures. The most important aspect of this system is one's mind and intention. In other words, one's intention should be sharply focused on each movement, and the movements are led by one's mind and intention. Intention, rather than physical force, is used. As a result, at the connecting points of different postures, although physical strength appears to be momentarily disconnected, one's intention connects the postures and make them a seamless whole. Six Harmonies include harmonizing the body and heart/mind, heart/mind and intent, intent and Qi/energy, Qi/energy and spirit, spirit and movement, and movement and emptiness. Here, emptiness means wu-ji, that is, void state. It is a quiet, motionless state achieved when one's movement follows the body's automatic reaction to a specific circumstance. Eight Methods refer to (1) Qi (energy), circulating Qi to concentrate Shen (spirit); (2) Gu (bones), collecting energy inside the bones; (3) Xing (form), incorporating animal forms from nature; (4) Sui (to follow), circular and smooth motion responding to the situation; (5) Ti (lifting), lifting from the crown of one's head to have a floating feeling; (6) Huan (returning), coming and going in a cycle; (7) Le (suspending), being motionless and calm while waiting; and (8) Fu (concealing), looking for an opening while concealing yourself. The Six Harmonies relate to the unification of the body, and the Eight Methods relate to practical applications. 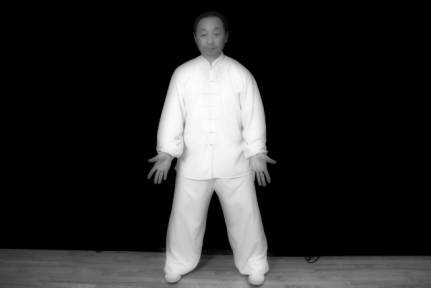 The ancient Taoist Li Dong-Feng said that Òa good method should be adaptable according to different circumstances and a superb technique will allow one to stand above the crowds. The movements of Liu He Ba Fa should be circular and flowing, and fast changing in response to circumstances. The crown of the head should be lifted as if suspended from the ceiling by a rope, and the tail bone is pointed downward in a central position. One moves in many directions, sometimes in high positions and sometimes in low positions, while smoothly connecting different movements. It is difficult for an opponent to predict ones next movement and change of direction. One should be calm when facing an opponent, looking for appropriate openings and changing strategies according to different circumstances. The energy should alternately open and close, rise and sink, and spirally move forward and backward, following oneÕs intention rather than being forced by oneÕs physical exertion. The energy movement is like the silk reeling movement of a spring silkworm, continuing with no breaking point. It is also like water of a river, flowing forward on and on without stopping. We are not referring simply to the external movements. The important aspect is one's intention. Even though one is physically moving, he is calm internally. Three Stances refer to stances of different heights when one is practicing. The classics have the following sayings: at the high stance, one can walk so fast as if he is chasing the wind; at the middle stance, one is moving like a swimming dragon; and at the low stance, one is very strong and demonstrates oneÕs real internal strength. Twelve Postures refer to the single posture practice method, and are named after twelve different animals. Since each type of animal has its own characteristics and special techniques for fighting for survival, martial artists have borrowed these techniques from various animals. The twelve postures show up in various parts of the Liu He Ba Fa system. The energy movement of Liu He Ba Fa is very complex, and we can only briefly discuss it here. The important aspect of Liu He Ba Fa is to focus on intention rather than on physical strength. One's mind, intention, spirit and qi should coordinate with the external body movement. When one part of the body moves, the whole body is set into motion. When one part of the body is still, the whole body is still. The movement should be the movement of the mind, intention, spirit and qi. In other words, one should have the "Six Harmonies." The energies expressed include hard energy, soft energy, spinning energy, rotating energy, whipping energy, pinning energy, hooking energy, sinking energy, shaking energy, and springing energy. The change of energy includes both blocking and attacking, storing and discharging, slowing down and speeding up, and emptying out and filling in. It circles around, extends out and withdraws, and opens and closes unpredictably. Sometimes the movement is relaxed and other times it is tight. Students should first try to have the correct external postures. They then slowly learn the internal energy movement so that they gradually master the Six Harmonies and Eight Methods. The theory of Liu He Ba Fa is quite deep. It has certain internal aspects of Xin Yi Fist, the empty and full change of Ba Gua stepping method, and the soft and hard energy of Tai Chi. Thus, it includes the Yin Yang exchange of all three internal martial art systems. At one time, Liu He Ba Fa was listed as one of the standard courses at the Chinese Central Martial Arts Institute and was highly regarded by many famous martial artists. 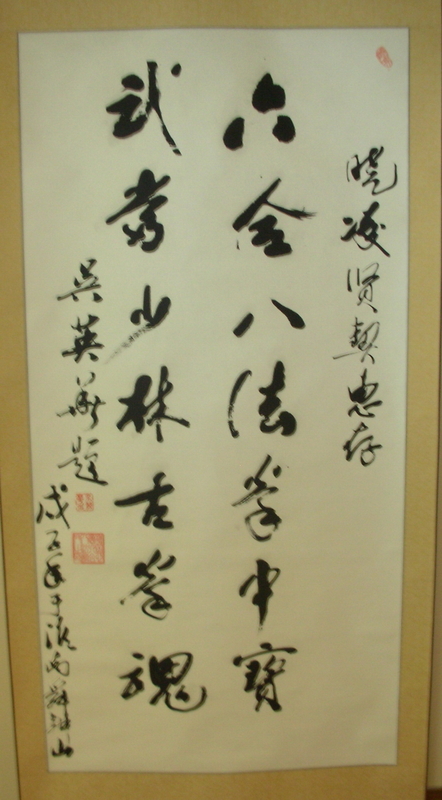 Mr. Zhang Zhi-Jiang, the head of the Chinese Central Martial Arts Institute, wrote a poem for Master Wu Yi-Hui: to lead the body with the mind and intention, one should start from the Eight Methods; hard and soft energies should be both employed so that Yin and Yang can be harmonized; when the body movements and the applications are understood and coordinated, the whole body is full of springing energy; one should be circular, extended, relaxed, harmonized and calm to cultivate the qi; to move like a swimming dragon externally and to store the precious qi internally; it is Master Wu that we depend on to spread and develop the great Liu He Ba Fa art. Some of the students of Master Wu from the earlier years went abroad and brought the Liu He Ba Fa system with them. As a result, Liu He Ba Fa has been taught in places such as Singapore, southeast Asia, Brazil, England and the U.S. I was very fortunate to be able to study with Master Li Dao-Li and Master Liang Qi-Zhong, two of Master Wu's disciples. Because of limited space and time, I can only briefly discuss Liu He Ba Fa here. I hope to receive feedback and comments from my colleagues in the martial arts community so that we can all contribute what we can for the development of the great Liu He Ba Fa system. 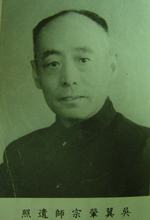 son of Wu Yi Hui. ©Copyright 2007 by WuDang Martial Arts and Xiaoling Liu.